It’s Friday, and this week it’s Buried Treasure time when we excavate and revisit gems — both tangles and articles — that might have become buried in the site. “Many of us are fascinated by the wonderful, mesmerizing line art murals of Justine Ashbee which she executes spontaneously by hand with paint pens. If you search Google and click on the Images tab, prepare to be blown away by her beautiful art. Here’s a great article with a quote from Justine about her process. To continue reading Simone’s wonderful free lessons, visit this page. Think of this as your tangle Challenge, if you’re so inclined. 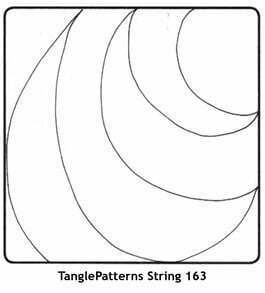 TanglePatterns String 163 is from California tangler Barbara Finwall and was originally posted here.